Sophomore QB showing poise under center; Cony lands gut-check win over Brewer. Early in the season, Winthrop/Monmouth coach Dave St. Hilaire noticed something off about Keegan Choate. It wasn’t the sophomore and new starting quarterback’s leadership, or his throwing mechanics, or the way he asserted himself in the Ramblers’ huddle. It was his feet — specifically, how he was using them. Choate went about fixing the weakness the only way he knew how. He put in work. Time on the practice field, time off of it, time in the gym and the weight room — and as the weeks went on, St. Hilaire saw perhaps Choate’s biggest flaw become one of his greatest strengths. That work ethic has helped Choate steadily grow into an asset for the Ramblers in his first season under center. The sophomore has led Winthrop/Monmouth to a 2-3 record, and seen his responsibilities grow in the process. 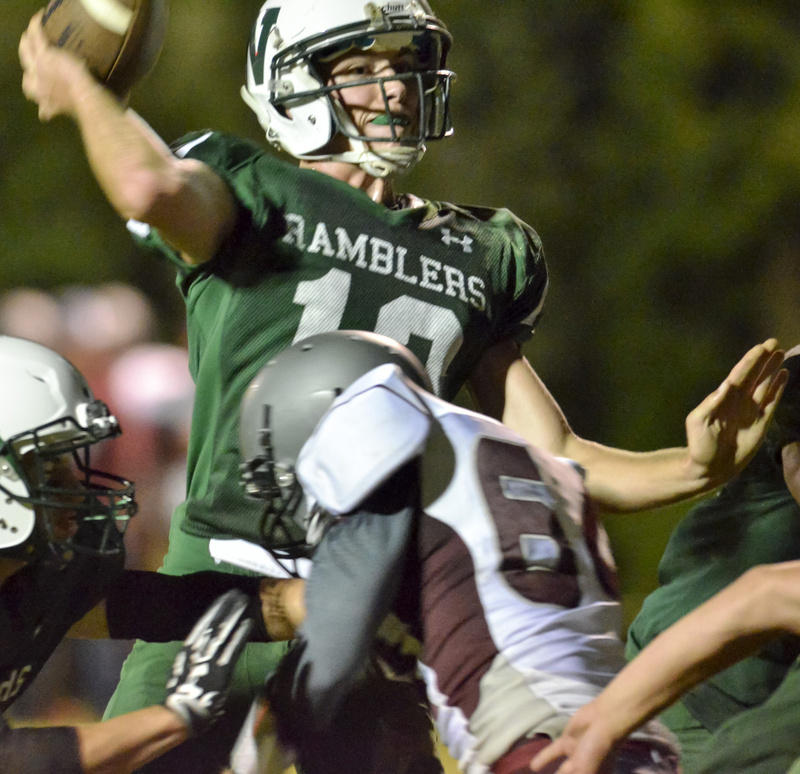 He guided his team to a potentially season-saving win over Ellsworth on Friday, completing 12 of 26 passes for 191 yards and three touchdowns to pull the Ramblers back from a second-half deficit en route to a 25-14 victory. Choate’s still only five games into his first season, and there’s plenty left to learn. But he acknowledged that, with each week, it’s getting easier. Choate had an up-and-down season on junior varsity last year, but when it came time for this season, St. Hilaire was struck by how determined the 6-foot, 185-pound signal caller was to improve. Choate doesn’t look at it as work. To him, it’s part of the fun. There were some bumps along the way. Choate had to learn to command a varsity offense, gain the varsity players’ respect — and, in some cases, be reminded of the varsity plays. All part of the learning process — one that for Choate is going pretty well. Cony scored another big win Friday night. And this time, the Rams (3-2) could celebrate it. Cony rallied back from an eight-point deficit in the fourth quarter, scoring a pair of touchdowns to upend Brewer, 20-14. It was the Rams’ third straight win after an 0-2 start, but unlike the previous victory over Mt. Blue, in which a pair of defensive starters suffered season-ending injuries, there was nothing to ruin the mood this time. Down 14-6 late, the Rams had to work for it. Logan Leadbetter scored on a 6-yard touchdown run with 6:30 to go, with Matthew Wozniak hauling in the tying two-point conversion pass. Cony then took over with just under two minutes left, and Anthony Sousa found the end zone for the winning score on a 1-yard run with half a minute to go. To Lippert, the rally said plenty about the Rams’ mental toughness. There was also a degree of revenge after Brewer bounced Cony from the Class B North semifinals last season, but Lippert downplayed that angle. Maranacook was given an impromptu bye week, courtesy of the Traip Academy football team. And the Black Bears decided to make the most of it. The teams were supposed to play last weekend, but the weekend became an empty date after Traip shut down the remainder of its varsity season the previous week. So Maranacook (4-1) had a week off, which coach Walter Polky determined was actually the best thing for his team. Maranacook has another game with Traip scheduled for Oct. 21, but the team will instead play the following Monday against Lawrence’s JV team. Bye weeks could be back in the Black Bears’ future, however, as the five teams still playing in Class E will have a postseason tournament, with teams seeded first to third getting a week off and teams seeded fourth and fifth playing each other in the first round.